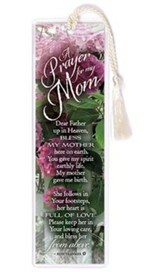 Keepsake gift bookmark adds a special touch to cards and gifts, an extra note of love and caring. Photography with quality font design; 2.25" x 7.25" in durable vinyl sleeve with silky tassel. Dear God I gratefully thank you for giving me my Dad. You must really love me, 'cause you gave the best you had. and may he feel my love for him, is my humble heartfelt prayer. I'm the author/artist and I want to review A Prayer for My Dad Bookmark.